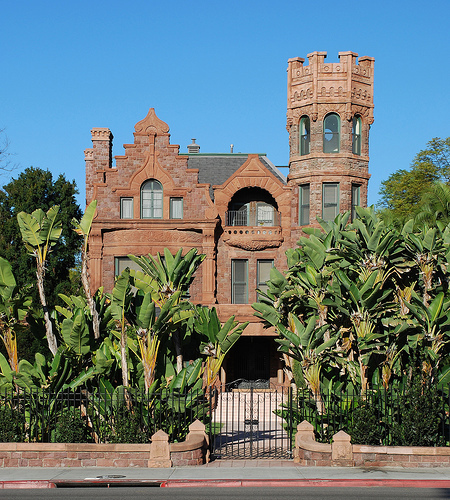 On the night of February 6 1896, an explosion rocked the slumbering West Adams neighborhood. “Dynamite fiends” had apparently attempted to blow up the house of Thomas Douglas Stimson at 2421 Figueroa (figure 1). Neighbors George and Frank Sabichi ran to help with their guns drawn. They fired at a shadowy fleeing figure, but the man managed to escape unharmed by jumping on a passing street car. Initially, the motive was unknown. However, true to its anti-labor bias, the Los Angeles Times had a “theory of the crime” and rashly reasoned that “some Anarchist or enemy of capitalists” must have orchestrated the attack. It was later revealed that greed, not politics had been the primary motive. 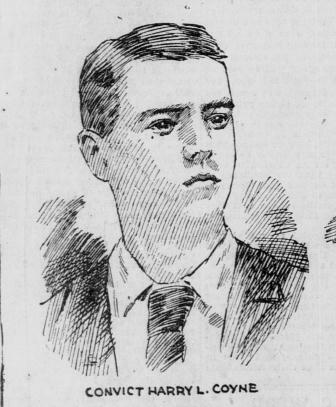 On February 19th, a private detective named Harry Coyne was charged with “assault to commit murder.” Coyne had apparently attempted to buy his way into a night watchman’s job by telling Stimson that his family was “in danger from the machinations of a notorious Mexican crook.” It was not the first time that Coyne had been involved in such a scheme. Despite this notoriety, Thomas Stimson hired Coyne to accompany his son on a trip to Mexico City. When the group returned, Coyne informed Stimson about a “plot to do him injury.” For $60 Coyne would inform on the conspirators and “deliver them to the police.” Stimson declined the offer, but found Coyne to be a very persistent bodyguard. The young man visited Stimson’s office daily to talk about the plot. He then staged a burglary attempt and finally used the dynamite to sustain the credibility of the story. At this point Coyne’s price for protection had increased to $250. In June, Coyne was sentenced to five years in Folsom State Prison where perhaps the story should have ended. However, after less than two years in Folsom, Coyne was discovered counterfeiting nickels in the engine room of the prison’s rock crushing plant. While a number of the prisoners were able to get away, Harry was caught red-handed. “Dynamite Fiends: An Attempt to Blow-Up the Stimson Mansion”. Los Angeles Times, Feb 7, 1896; ProQuest Historical Newspapers: Los Angeles Times (1881-1990), pg. 10. 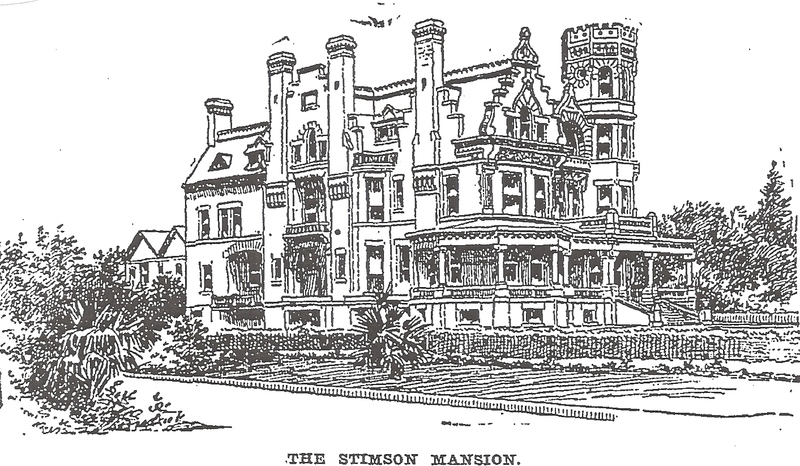 Stimson had recently retired to Los Angeles after a long career as the head of a profitable lumber business in Michigan and Illinois. In LA, he was warmly welcomed as part of the city’s new elite. He was one of the largest shareholders in the Citizens Bank and was vice president of the Los Angeles Chamber of Commerce.